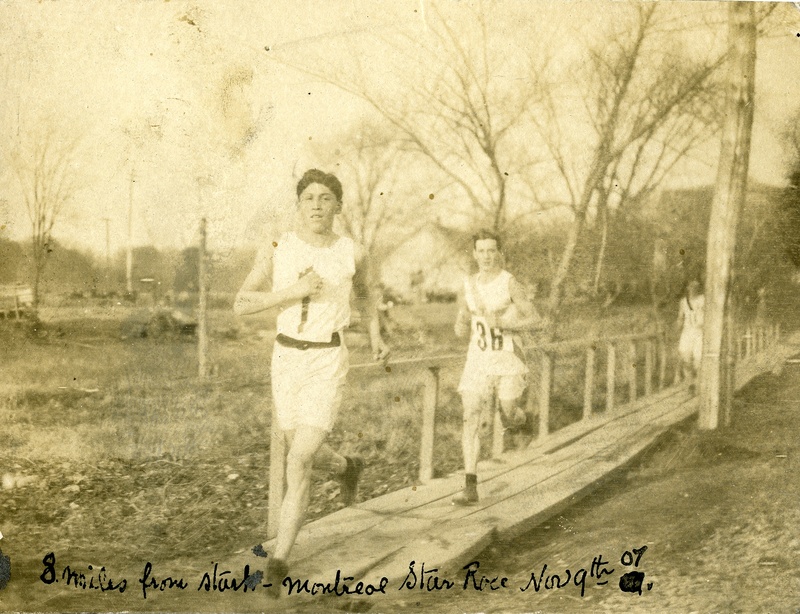 In beginning of the 20th century, marathon running was the hottest sporting entertainment on earth. One of its biggest stars was an Onondaga – Canadian from near Brantford, Ont. named Tom Longboat. On his day (and his day came often) Longboat was the best long-distance runner the world had ever known. Huge crowds fought for tickets to watch him race indoor marathons, head-to-head in smoke-filled arenas, 200-plus dizzying laps to the throbbing music of live bands, and they gambled big money on him. Yes, the marathon was different between 1907 and 1909. But Tom Longboat helped to make it what it is today. It was at the 1907 Boston Marathon that Longboat first earned the title of world’s greatest runner. Longboat was only 19 and running just the fifth and longest race of his life. He faced cold, bitter weather and the strongest American and Canadian field ever assembled – three previous Boston winners, and the reigning and future Olympic champions, Thomas Hicks and Johnny Hayes. Standing on the start line in the sleepy town of Ashland, at 5’9″ Longboat was taller than his competition. But the teenager surprised the world-class field. With his deceptively clumsy-looking stride, low arm action, astute tactics and an amiable smile, Longboat broke away in a snowstorm in the most difficult section of the race – the Newton Hills – and smashed the course record by five minutes. Longboat’s secret was his habit from boyhood of going for very long runs which gave him reserves of endurance on race day. Longboat’s infectious smile throughout the race astonished the crowd that was used to seeing great anguish on the faces of runners. When a young woman ran out near the Boston finish and presented him with a Canadian flag, Longboat made her a courteous bow before running on, flourishing the flag. Boston in those days was 39.75k. “Marathon” meant “long road race,” which could even mean 10k. When Longboat first won the Ward Marathon on Toronto’s waterfront in October 1906, it was 24k. The world would soon acquire a more precise meaning when the 1908 Olympic organizing committee in London ended up with a 42.195k course with a start at Windsor Castle and end at White City Stadium. Longboat, sadly, didn’t get to the stadium. He had arrived in London the hot favourite, joked cheerfully as usual with the press and looked well-placed and confident early in the warm late-July race. The leaders (all Brits until halfway) passed one mile in 5:01, 8k in 27:01 and 16k in 56:53. Although Longboat kept back from this folly, he wasn’t far enough back, always in the top ten. He was being cautious because he’d missed the Canadian trial in June due to illness – probably a blood infection which had caused boils and cramps. When he began his move a little after halfway, for the first time in Longboat’s career there was nothing in the tank. He struggled. He tried to shake it throwing in a surge, but then faded again. At 32k, Longboat began to stagger, and then he fell to the ground. He tried to get up but it was over. Charles Hefferon of South Africa, Italy’s Dorando Pietri and the American Johnny Hayes were left to enact the final scenes of a drama that, with Pietri’s collapse, seared the marathon into the world’s imagination. Meanwhile, Longboat travelled the last 10k of the marathon getting ill in the back of a car. Everyone had a theory as to why Longboat failed. They still do. He was overtrained. He was undertrained. He was overwhelmed by being idolized. He was distracted by the politically-motivated efforts of the American manager, James Sullivan, to get him banned as a professional. He drank too much (they said). He was a typical “unreliable Indian” (they said). He got injured while training in Ireland when a wagon collided with him. Some even speculated that his over-enterprising manager, Tom Flanagan, drugged him to ensure a gambling fix. Lost in all of this speculation was what Longboat himself had to say. “It was terribly warm,” one paper reported Longboat saying. “The roads were fierce. Asphalt and cobblestones that simply pounded to pieces the feet of one used to running on dirt roads.” It was indeed hot and humid, yet every runner in the field went out insanely fast, except Hayes, who ran the first half patiently and won the race. After two lacklustre races in Hamilton and Toronto, Longboat bounced back to break the Canadian 5-mile record (26:05.6), then won the Ward Marathon (now 30k) for the third time, by eight minutes. That recovery pattern supports the theory that Longboat’s problem in London was illness. Flanagan set up a late-summer tour of agricultural fairs, where Longboat won “marathons,” usually 10–16k, pulling in the punters in places like Williamstown, Ont., where “the crowd was so thick that there were collisions between runners and spectators.” Five thousand watched him break the 5-mile record at the Hamilton Jockey Club ground. This was showbiz. There was money to be made. Enter Pat Powers, a New York entrepreneur, with ideas much bigger than rural Ontario fairs. In November 1908, he made Pietri and Hayes offers they couldn’t refuse: to turn pro and re-stage their Olympic drama in America. New York’s Italian and Irish populations, 16,000-plus of them, jammed into the old Madison Square Garden, cheering, betting, singing along with Italian and Irish bands and fighting each other in the aisles, as Pietri and Hayes duked out 262 laps. Police had to cudgel a path through cavorting Italian fans to let Pietri complete his victorious last lap. Three weeks later on Dec. 15, 1908, it was Pietri versus Longboat, also now openly professional. In another packed house, Longboat’s fans tried to drown Pietri’s Italian music with war-whoops. Women in fringed buckskin posed beside the track. Thousands of Italians who had been sold scam tickets beat angrily on the gates. In Times Square, traffic was jammed solid, as people thronged around bulletin boards to follow the race’s progress. For 40k it seemed a stalemate. Longboat, back in top form, loped with seeming casualness behind the eager diminutive Italian, lap after lap, for 250 laps. With 11 laps, less than 2k to go, Longboat struck. Pietri held on for three desperate circuits, but suddenly, he fell to the track. Exhausted, Pietri was even “too far gone to speak” after the race, said newspaper reports the following morning. A comic vaudeville song about the race was quickly released, sung in the voice of a poor Italian barber character who had staked his whole business on Pietri. “Just then, Dorando, he’s a drop! Good-bye, poor old barber’s shop!” It was by a young Russian-born composer who soon after adopted the name of Irving Berlin. The song never mentions Longboat, but he was now in effect the professional marathon champion of the world. Running was set up like boxing, so now Longboat had to defend. His first challenger would be English superstar Alfie Shrubb. As an amateur, Shrubb had won the international cross-country championship twice, and set at least 15 world track records. Shrubb was seeking a living as a pro in North America. He eventually settled in Bowmanville, Ont., where he is now commemorated by the Alfie Shrubb Classic 8k. Madison Square Garden, Feb. 9, 1909: Shrubb liked to go out fast, and he had done the intensive training to hold on and win – until he tried the marathon. By now, that meant precisely 42.195k, “the London distance,” an hour beyond Shrubb’s tested limit. Unafraid, he ran his first mile in 4:52 – that’s a 2:07 marathon pace, at a date when the world best was 2:36. Longboat coolly let him go. In a two-man race in front of a vociferous crowd, this took courage and belied the “erratic red man” reputation that had cruelly followed him after the Olympics. Despite the crowd’s jeers, he was not going to repeat his London mistake, as Shrubb nipped by on the tiny crushed-cinders circuit, lapping and relapping him. At 27k, Longboat was eight laps behind, more than one kilometre. But in reality he was winning. At 30k, Shrubb began to falter, and lost a lap. Then, he had trouble with a shoe, and lost another. By 37k, he was walking and jogging, and the gap was down to two minutes. At 38k, with Shrubb reduced to a shuffle, Longboat strode past and the crowd erupted in mock-Indian howls and chortles. Longboat successfully defended his championship. He lost it two months later on April 3, 1909, when a little Frenchman, Henri St. Yves, decisively won the “Great Marathon Derby.” It was contested between the world’s best six runners including Shrubb, Pietri and Hayes, at New York’s Polo Grounds. The heavy rain and slushy-going may have been Longboat’s undoing, or perhaps he had simply already peaked. From then on he mostly raced near home, often against Shrubb. Longboat married in 1908 and volunteered for the First World War in 1916. He won regimental races and then did duty as a messenger runner in the trenches, a job so dangerous that he was twice reported dead. When he finally returned home from the war, his wife had remarried. Later he happily did the same and had four children. He tried his hand at farming, worked in factories and mills, was a teamster and eventually a Toronto city garbage man. That was no failure during the Depression for a man of limited formal education who confronted race prejudice daily. He was always employed, had a good suburban home and a car, was loved by his family, kept fit with long walks and continued sometimes to turn out for exhibition races against other legends of the first great running boom.He and his wife Martha eventually quietly moved back to the Six Nations Reserve at Ohsweken. When he died in 1949, many sporting celebrities spoke warmly of him. None of that fits with the rumours of drinking and misdemeanour that erroneously taint his legacy. It took a scholar-runner to see through the distortions. Forty years ago, Bruce Kidd, Canada’s 1962 Commonwealth Games gold medallist and professor in the faculty of kinesiology and physical education at University of Toronto, saw the discrepancy between the accusations of laziness and alcoholism and Longboat’s race performances and employment record. “The more I dug into his career, the more I realized that there was another side of the story – that Longboat had a strong sense of his own body, a sophisticated approach to training drawn from the Iroquois tradition,” wrote Kidd in the introduction to a 2013 research paper. Kidd takes every opportunity to set the record straight, rejecting the insulting labels that Longboat had to contend with in his time. Those included “the tottering Indian,” “erratic red man,” the “heathen” (that was an Anglican archbishop’s label for Longboat when he requested a Christian marriage). By contrast, Longboat’s Onondagan name,“Cogwagee,” means “Everything.” He was not easily reduced to a stereotype. Tom Longboat was the only Canadian distance runner so far to prove himself definitively as the world’s best, and he did it three times: once at Boston and twice at Madison Square Garden. But Longboat’s historical importance reaches beyond Canada. He was the first world-class non-white marathon runner. In the first Olympic marathon, a Greek peasant water-carrier took over the lead from a wealthy London-based Australian accountant, a contest that would have been unthink- able in any other sport in 1896. Pietri was a cake-maker, Shrubb a rural builder, Hefferon a prison guard, Hayes a sandhog. Longboat the Onondaga from the Six Nations Reserve added a dimension of inclusiveness that would enrich the sport, make running a social leader and benefit the Ethiopians and Kenyans when their turn came to win marathons in Longboat’s footsteps.